It might seem overwhelming when you start to think about all the marketing strategies like social media, websites, networking, speaking, etc. needed to grow your business. I can sound like a lot of things to do. I want to simplify things for you to let you know that marketing and sales are not that complicated. I want to demystify what it’s really about. All it’ll take is answering a few simple questions in order to design your own effective marketing strategy. It doesn’t have to be that complicated. Here are my four questions that will help you think what you need to implement in your business and be able to go from zero to hero. The first question you need to answer is: Who is my ideal customer? About 80 percent of the time when I ask entrepreneurs, solopreneurs, and small businesses who their your ideal customer is, I usually hear ‘Oh everybody, anybody who’s interested in this.” No, no, no, no. Please don’t do that. Make sure that you have a very clear description of your ideal customer. This is super important. That customer needs to fit a very specific profile and a niche. In a past episode, I explained how to choose your avatar, your ideal customer. Make sure that you know exactly how to describe your ideal customer in terms of age, gender, lifestyle, needs. That has to be clear. And on top of being clear, you want to focus on a very small niche. I explained in previous episodes the importance of doing that and I just want to remind you of this powerful quote that says: If you want to reach out to everybody, you will reach out to nobody. Make sure you become the expert of that little niche and the type of people that you want to reach out to. So the first question is, who is your ideal customer? And that has to be very clear. The second question to be able to design your effective marketing strategy is: Where is my ideal customer? Once you know who your ideal customers are, you also want to know where they are and where they hang out. Before I go deeper in how to that, I have to reveal the third question because the two are very connected. The third question you want to answer is: How can I reach out to that customer and transform that person into a client? In order to know where your client is and how you can transform them into a customer, the key thing is to do market research. I know that might be something that you don’t want to hear about, but you cannot allow yourself to run a business or start your business without market research. I meet so many people who struggle in their businesses and most of the time it‘s because they haven’t done market research. Take the time to research your market and to find out who your ideal customer is, where they are and how you can transform them into customers. How do you start market research? First, research all the platforms that your clients like. For example, the blogs and magazines they read, the trade fairs and shops they go to… look at all the things that your ideal customers consume for content. The second thing you want to find in your market research is the needs, the pain points and challenges of your potential customers. You will never be able to transform a prospect into a client if you don’t know exactly the pain points and the problems they have. Through market research and by running surveys you can gain this valuable insight. Make sure before you run your business, before you start your business, that you have done in-depth market research. Find out all the platforms that they use to consume content. Find out what they need. Also, just talk to them, listen to them. You can have coffees with your potential clients or run an online survey. Run a focus group or talk to people who already deal with this type of clients and know about them. On top of that, if you already have a business and already did market research when you started, make sure to continue the market research. It’s non-stop. When you start and launch a business, you have to continuously be aware of the needs of your clients and the evolution of a market. Who are your competitors and what are the new media that your potential clients are consuming, etc. I want you to understand at the end of the day that running a business is more about listening than selling and talking. Make sure to listen to your market and there’s no other way to do it other than by in-depth market research, studies, and surveys in order to get that information. It’s only when you have done that, that you will become a master at transforming your prospects into customers. Finally, the last question you need to answer to design an effective marketing strategy that allows you to grow your business is: How do you keep your customers happy? Make sure that your clients are satisfied and that they are recommending you. Marketing doesn’t stop when you sell. Sales don’t stop when the financial transaction is over. The sale continues until you deliver your product or service and you make sure that it’s the quality and up to the standard that your client is expecting. I want you to have the mindset that marketing and sales are actually about helping people and about delivering the value that you’re promising. Make sure that in your strategy you’re thinking about that. How can I make sure that my clients are satisfied and are reaching out to them after they consume a product, a service? Are they satisfied with every term? For instance, you sell a product or service, send a satisfaction survey. Make sure that they are satisfied and if not, find a way of how you can correct that. There’s nothing better than making sure that your customers are satisfied because if they’re satisfied, they will talk about you. You should treat them like VIPs and they will be sure to always recommend you. Then, you will have to spend less time and energy to get more clients. Let me summarize the four important question to ask in order to build your marketing strategy. How do you reach your ideal customer and how do you transform them into customers? How do you keep your clients happy and encourage them for referrals, reviews, and testimonials? At the end of the day, marketing and sales are only about answering these four questions. You might come up with lots of different ways to do so. Make sure that you do not have too many different strategies in order to answer these questions. Focus on one method and don’t choose more than three maximum. Don’t try to do everything at once. Focus on one strategy and do it consistently. That is the key to any marketing strategy success. I hope this was helpful and I can’t wait to hear from you, so please let me know in the comments section. What is the major insight you got from this episode? What is the one thing you will implement in the near future to be able to design the right marketing strategy? I also want to know, did you do market research when you started or after starting a business? If yes, I would love you to share with us what has helped you to do it. Your insights might be helpful to others listening to this episode. 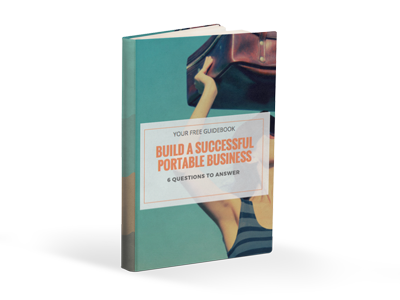 Sign up to download your free e-book to turn your business idea into revenue and impact!